Great Glen Community Wildspace currently manages several areas in and around Great Glen under licence from the landowners. These include Burton Brook Wildspace, the Sence ‘meanders’, and the Embankments. A map showing the location of these in relation to Great Glen village can be seen below. 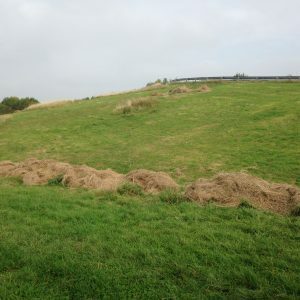 This area was created following work by the Environment Agency in 1998, as part of a flood alleviation scheme, to collect excess water from the Burton Brook in the event of heavy or excessive rain. It is about 9 acres in area and can be accessed from the rear of the Pug & Greyhound public house on London Road, or via the footpath leading from the end of The Nook, nearby. This space has a diversity of habitat, including a pond, stream, wetland area with reed bed, wildflower bank, hedging, grassland and native trees. 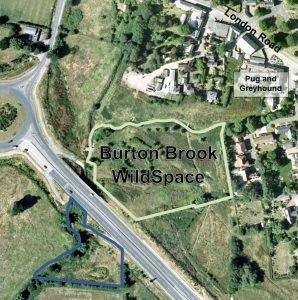 Satellite image of the area of Burton Brook Wildspace. This is the area along the riverside in the Recreation Ground within the village (see map). It can be accessed via the entrance from the Recreation Ground (via the playing fields), or by a track from Bridgewater Drive. The area consists meadows, a small community orchard and some wetland habitat along the river. The managed area also includes land adjacent to houses in Bridgewater Drive further north along the River Sence. These embankments flank the farm track over the A6 dual carriageway, which is reached from Orchard Lane in the village. They are to the rear of the new crematorium that has been recently constructed and were created during construction of the A6 bypass during 2005. 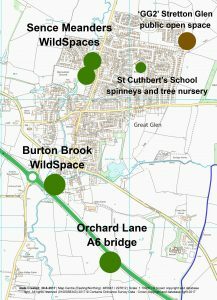 With permission from the landowner the Wildspace group manages the site for the benefit of a variety of wildflowers and have replanted a hedge with hawthorn and native trees. We have recently mown the largest of the four embankments, with the aim of encouraging more unusual wild flowers. Here is a picture after mowing and raking the grass, though it is difficult to show the size of the embankment without an aerial photograph!